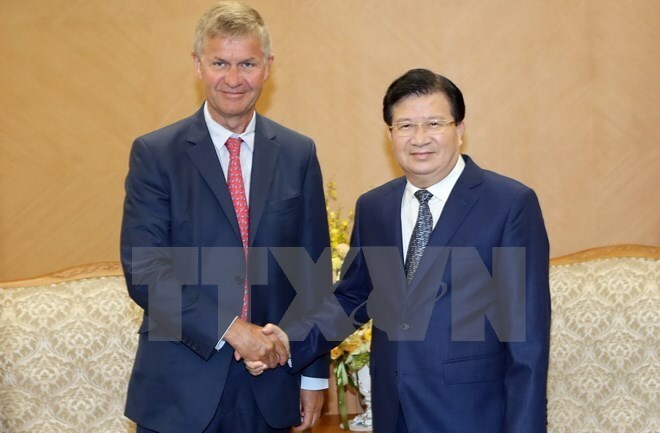 Hanoi (VNA) – Deputy Prime Minister Trinh Dinh Dung met Director of the UN Environment Programme Erik Solheim Hanoi on August 8, during which he proposed that the UN Environment continue supporting Vietnam in reviewing, revising and completing laws and policies related to environment. Vietnam hopes to receive assistance in conducting national action programmes on responding to climate change, green house emission, and forest protection, said Deputy PM Dung. He also suggested that the UN Environment sent experts to Vietnam, and share experience in environmental protection and related issues, while helping the country in personnel training. He affirmed that the Vietnamese Government is always determined to protect the environment and not to exchange the environment for economic development. At the meeting, Deputy PM Dung lauded the cooperation and support that the UN Environment has given to Vietnam over the past years, especially in technique, experience, policy-making, and personnel training, which has significantly contributed to protecting the environment in Vietnam. He clarified the Government’s management and direction in designing socio-economic policiesas well as legal administration is crucial in preserving the environment, along with the development of renewable energy and science and technology, the improvement of human resources and community’s awareness in the field. Currently, Vietnam is going forwards green and environmentally-friendly growth with science and technology playing the core role, and the private sector acting as pioneer in ensuring waste treatment and minimisinggreen house emission. For his part, Erik Solheim congratulated Vietnam on socio-economic development, especially in agriculture and education expressing hope that Vietnam will continue gaining success in the area of environment. Sharing Dung’s opinion, Solheim said that the UN Environment will continue walking hands in hands with countries, including Vietnam in promoting cooperation and support in the environment. During his visit to Vietnam, Solheim and his delegation also visited the Cuc Phuong National Park and recognised Vietnam’s efforts in preserving rare animals.